For the saint and bishop of Trent, see Vigilius of Trent. 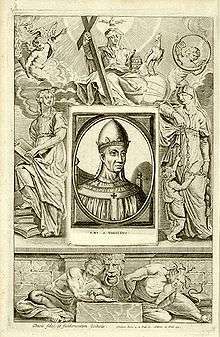 Pope Vigilius (died 7 June 555) was Pope from 29 March 537 to his death in 555. He is considered the first pope of the Byzantine Papacy. He belonged to an aristocratic Roman family; his father Johannes is identified as a consul in the Liber pontificalis, having received that title from the emperor. According to Procopius, his brother Reparatus was one of the senators taken hostage by Witigis, but managed to escape before the Ostrogothic king ordered their slaughter in 537. Vigilius entered the service of the Roman Church and was ordained a deacon in 531, in which year the Roman clergy agreed to a decree empowering the pope to determine the succession to the Papal See (something theologians now consider invalid). Vigilius was chosen by Pope Boniface II as his successor and presented to the clergy assembled in St. Peter's Basilica. The opposition to such a procedure led Boniface in the following year to withdraw his designation of a successor and to burn the decree respecting it. The second successor of Boniface, Pope Agapetus I (535–536), appointed Vigilius papal representative (apocrisiary) at Constantinople. Empress Theodora sought to win him as a confederate to revenge the deposition of the Monophysite Patriarch Anthimus I of Constantinople by Agapetus and also to gain aid for her efforts in behalf of the Monophysites. Vigilius is said to have agreed to the plans of the intriguing empress who promised him the Papal See and a large sum of money (700 pounds of gold). Empress Theodora soon learned that she had been deceived. After Vigilius had attained the object of his ambition and been made pope, he maintained the same position as his predecessor against the Monophysites and the deposed Anthimus. A letter purported to be from the pope to the deposed Monophysite patriarchs Anthimus, Severus, and Theodosius seems to indicate that Pope Vigilius accepted the Monophysitism. This letter, however, is not regarded as genuine by most investigators and bears all the marks of forgery. The pope did not restore Anthimus to his office. In the year 540 Vigilius took a stand in regard to Monophysitism, in two letters sent to Constantinople. One of the letters is addressed to Emperor Justinian, the other to the Patriarch Menas. In both letters the pope supports positively the Synods of Ephesus and Chalcedon, the decisions of his predecessor Pope Leo I, and the deposition of the Patriarch Anthimus. Several other letters written by the pope in the first years of his pontificate give information respecting his interposition in the ecclesiastical affairs of various countries. On 6 March 538, he wrote to Bishop Caesarius of Arles concerning the penance of the Austrasian King Theudebert I on account of his marriage to his brother's widow. On 29 June 538, a decretal was sent to Bishop Profuturus of Braga containing decisions on various questions of church discipline. Bishop Auxanius and his successor, Aurelian of Arles, entered into communication with the pope respecting the granting of the pallium as a mark of the dignity and powers of a papal legate for Gaul; the pope sent suitable letters to the two bishops. In the meantime new dogmatic difficulties had been developing at Constantinople that were to give the pope many hours of bitterness. In 543 Emperor Justinian issued a decree which condemned the various heresies of the Origenists; this decree was sent for signature both to the Eastern patriarchs and to Vigilius. In order to draw Justinian's thoughts from Origenism, Theodore Askidas, Bishop of Caesarea in Cappadocia, called his attention to the fact that the condemnation of various representatives of the Antiochene school, who were said to have inspired Nestorianism, would make union with the Monophysites much easier. The emperor, who laid much stress upon winning over the Monophysites, agreed to this, and in 543 or 544 he issued a new edict condemning the Three Chapters. The Eastern patriarchs and bishops signed the condemnation of these Three Chapters. In Western Europe, however, the procedure was considered unjustifiable and dangerous, because it was feared that it would detract from the importance of the Council of Chalcedon. Vigilius refused to acknowledge the imperial edict and was called to Constantinople by Justinian, in order to settle the matter there with a synod. According to the Liber pontificalis on 20 November, 545, while the pope was celebrating the Feast of St. Cecilia in the Church of St. Cecilia in Trastevere, and before the service was fully ended, he was ordered by the imperial official Anthimus to start at once on the journey to Constantinople. The pope was taken immediately to a ship that waited in the Tiber in order to be carried to the eastern capital while a part of the populace cursed the pope and threw stones at the ship. Rome was now besieged by the Goths under Totila and the inhabitants fell into the greatest misery. Vigilius sent ships with grain to Rome, but these were captured by the enemy. If the story related by the Liber pontificalis is essentially correct, the pope probably left Rome on 22 November 545. He remained for a long time in Sicily and reached Constantinople about the end of 546 or in January 547. After his transfer to Constantinople, Vigilius wrote/said to his captors: "Do with me what you wish. This is the just punishment for what I have done." and "You may keep me in captivity, but the blessed Apostle Peter will never be your captive." While in captivity, Vigilius sought to persuade the emperor to send aid to the inhabitants of Rome and Italy who were so hard pressed by the Goths. Justinian's chief interest, however, was in the matter of the Three Chapters, and as Vigilius was not ready to make concessions of this point and wavered frequently in his measures, he had much to suffer. The change in his position is to be explained by the fact that the condemnation of the writings mentioned was justifiable essentially, yet appeared inopportune and would lead to disastrous controversies with Western Europe. Finally, Vigilius acknowledged in a letter of 8 December 553 to the Patriarch Eutychius the decisions of the Second Council of Constantinople and declared his judgment in detail in a Constitution of 26 February 554. Thus at the end of a sorrowful residence of eight years at Constantinople the pope was able, after coming to an understanding with the emperor, to start on his return to Rome in the spring of 555. While on the journey he died at Syracuse. His body was brought to Rome and buried in the San Martino ai Monti over the Catacomb of Priscilla on the Via Salaria. ↑ Kirsch, Johann Peter (1912). "Pope Vigilius". In Herbermann, Charles. Catholic Encyclopedia. 15. New York: Robert Appleton Company. ↑ Fanning, William (1911). Papal Elections. The Catholic Encyclopedia. Vol. 11. Robert Appleton Company. New York. Online transcript by Robert A. Orosco (31 August 2016). New Advent. Knight, Kevin (editor). Archived on 8 April 2016. "It is commonly held also that he is prohibited from doing so by Divine law". ↑ Carroll, Warren H. (1987). The Building of Christendom. Front Royal, VA: Christendom College Press. ISBN 0-931888-24-7. Josef Rist (1997). "Vigilius". In Bautz, Traugott. Biographisch-Bibliographisches Kirchenlexikon (BBKL) (in German). 12. Herzberg: Bautz. cols. 1383–1387. ISBN 3-88309-068-9. Wikimedia Commons has media related to Vigilius. 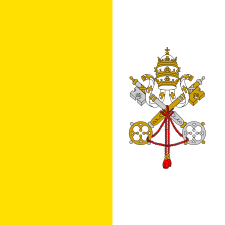 Wikisource has the text of the 1913 Catholic Encyclopedia article Pope Vigilius.